Our new system has the following features. 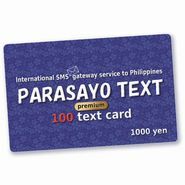 PARASAYO TEXT is a brand new International SMS Gateway Service which connects Philippine cellphone SMS and Japanese and all over the world email. You can communicate with your important person using our service, any time any where. Our system has started running on new and more powerful platform which provides the following premium service. Faster and more stable sending and receiving message. Replying from Philippines without using user-id. Sending and receiving long message more than 160 letters and messages written in Japanese character. You can pay for your order by Credit Card with PayPal. You will recieve your PIN by email immediately if you choose email delivery and Credit Card payment after you finished place your order whenever 24H/7D even its out of our office hours. You can send sms to Philippines from your cellphone or PC even you are out side of Pilippines and the costs is cheapest. Don't miss it! Its free!! 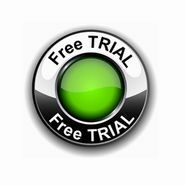 Now we are offering FREE trial as a opening campaign. Let's try and experience our new service now. Here is how to use our service. To regist, To send message to Philippines,... etc. Its very easy for any one. Only 1 peso to reply! It costs only 1 peso to reply in Philippines. You can get it just answer to few simple questions. We show you how to use with actual screen shot.